Arrive between 3:30-3:45 at the Shoppette on Plaza Housing to catch the bus! OIWC members have been invited to participate in an evening of holiday cheer! 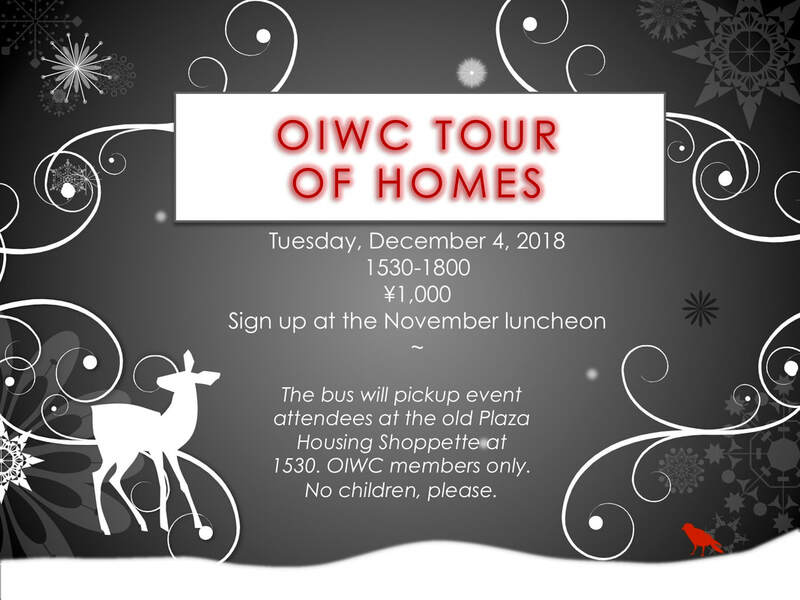 Come out for an evening to tour 4 homes with fellow OIWC members! Light appetizers and beverages will be served. The cost is ¥1,000 in cash. Reservations and cash payment must be made in person at the December Bazaar Luncheon on December 4th. This is a first come first serve event as there is a limit on the number of participants. *Please park here. There will be a bus to take you to each of the houses. **For this event, you must be a paid OIWC member to attend. 1040-1120: Tour the Kin Limestone Cave, Awamori Cellar and awamori tasting. PAYMENT: Please pay via a drop box location, NOT PayPal. Thank you for your understanding. 3. Include exact amount in Japanese Yen; all excess will be donated. 4. Place enveloped into red lock box labeled OIWC at one of the locations listed on our website. DO NOT leave envelope if this box is not present. *If you signed up at the luncheon but did not pay, please make your payment using a drop box.